Openreach’s Lee Anderson, 39, is hoping to engineer a large donation for cancer charities as he gets ready to tackle a 13 mile charity night walk later this year. Lee, who’s based in Central Reading and has worked as an Openreach engineer for more than 20 years, is joining a group of friends to raise money for Cancer Research UK and 16 year old Londoner Alfie Ward, who suffers from Neuroblastoma, a rare form of cancer. They’re tackling the Shine Night Walk in London on 22 September, where they’ll walk through the capital at night, passing well-known landmarks such as Big Ben, Tower Bridge, St Paul’s Cathedral and Buckingham Palace. Lee and his friends are hoping to raise around £1000, which will be split between the national charity and helping Alfie get much-needed treatment abroad. Lee said: “As well as raising money for Cancer Research UK, we wanted to do something a little more personal this year. Through social media, we were put in touch with Alfie’s family and as soon as we heard his story, we knew we wanted to do all we could to help. Alfie has courageously battled cancer since he was just three years old, and the hope is that getting vital treatment abroad could help him beat the disease once and for all. 16 year old Alfie, from the London suburb of Ashford, was diagnosed with Ganglioneuroblastoma in September 2005 at the age of 3 years. Alfie was just starting nursery when this diagnosis came through. Doctors agreed to keep an eye on it through routine scans. Unfortunately, at the end of 2007, during a routine MRI scan, doctors found another lump in Alfie’s abdomen and in January 2008 he was diagnosed with stage 4 high risk neuroblastoma. Alfie then began the road to recovery and started the remission step of neuroblastoma. He went back to school and enjoyed being back with his friends. During another routine MRI scan in December 2011 the doctors found a query with the result, which signalled the start of intense chemotherapy to shrink the thickening area they found near Alfie’s spine and kidneys. Unfortunately chemotherapy didn't shrink it enough but confirmed that it was a relapse of neuroblastoma. Alfie’s Mother, Shelley, said: “We’re really grateful to all the people supporting Alfie. We’ve been told that antibodies therapy will give Alfie the best chance of recovery, but this has to be done privately so comes with a cost. Lee joined Openreach 20 years ago, after being encouraged to explore engineering by his father Roy Anderson, himself an engineer with the company for 35 years. 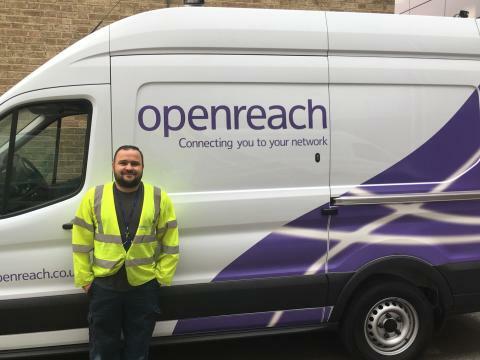 His day job includes connecting new customers to Openreach’s fibre broadband network – that now covers 95 per cent of the UK, installing new phone and broadband services, and fixing any faults that customers report. For more information about Openreach, who provide the UK’s largest telephone and broadband network used by the likes of BT, Sky, Talktalk and Vodafone, visit openreach.co.uk.